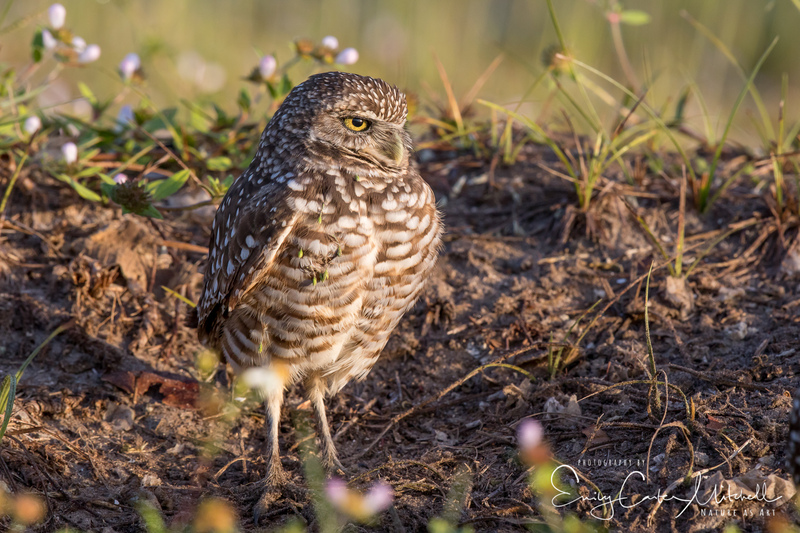 One of the many expeditions around the world that I would like to do was to travel to Southwest Florida and visit the Burrowing Owls of Cape Coral. I had heard of these darling little owls that live in holes throughout the town. Acting as mascots or perhaps even the town Mayor, these Owls are part of the landscape throughout. Due to forces beyond my control, I found myself in Naples this past week (Oh darn… LOL!) and realized that Cape Coral was an hour away from where we were staying for business. 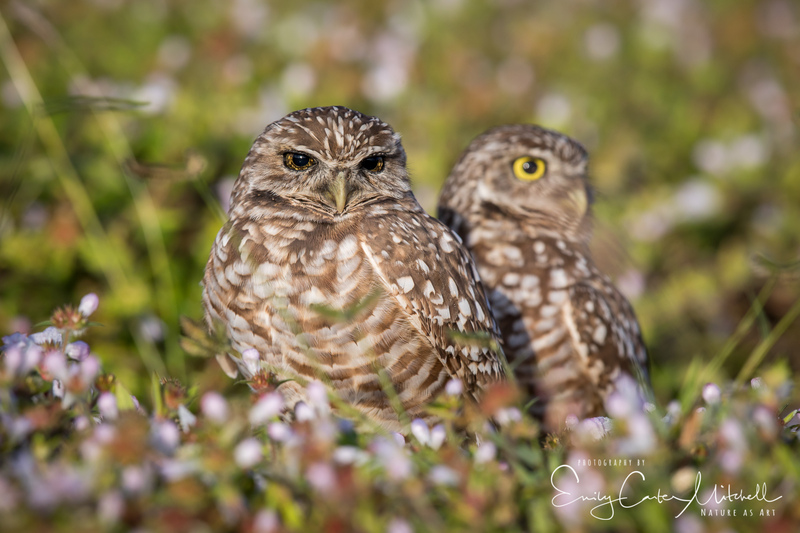 It didn’t take me long to discover a kind and wonderful person with Cape Coral Burrowing Owls that occasionally shows visitors around town to her favorite owl couples. Upon arriving for our morning out, we literally drove just a block away and found our first pair of owls. At first glance, you would have thought it was just an empty lot with stakes in the ground for perhaps construction. But the small sign indicated that it was a protected zone. Looking a little harder, two little brown heads that had blended into the weeds became apparent. 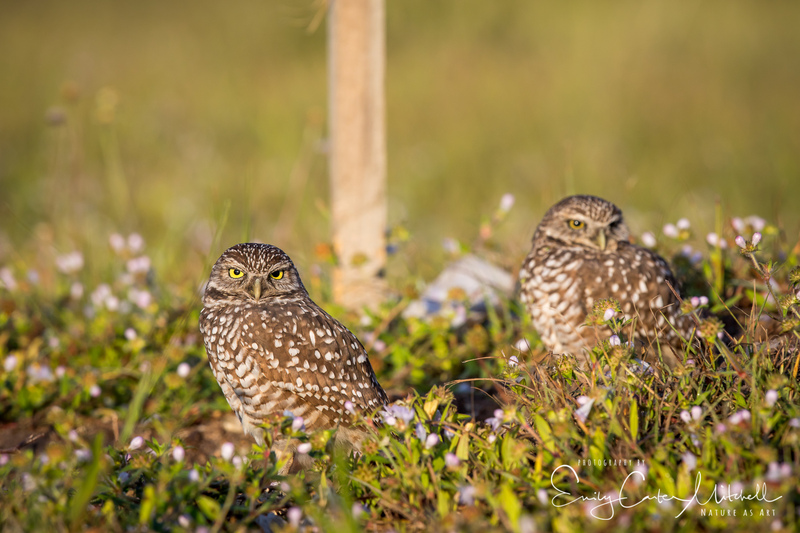 Cape Coral is home to over 2,700 Burrowing owls or burrows and is considered to host the largest colony of Burrowing owls throughout the world. These owls can be found throughout North and South America. Interestingly enough, this colony originated in Texas where they were rousted out by the Texas cattleman as they wanted to protect their livestock from breaking their legs in the holes made in the field by Prairie dogs, foxes and the owls. Killing them off in the early 1900’s along with the Prairie Dogs, the owls quickly learned it was time to relocate. They then moved to Sanibel Island which at the time was completely undeveloped. It wasn’t long before Sanibel Island also succumbed to the expansion of man and the development of condos and hotels. And once again the owls relocated, this time to their current home of Cape Coral. 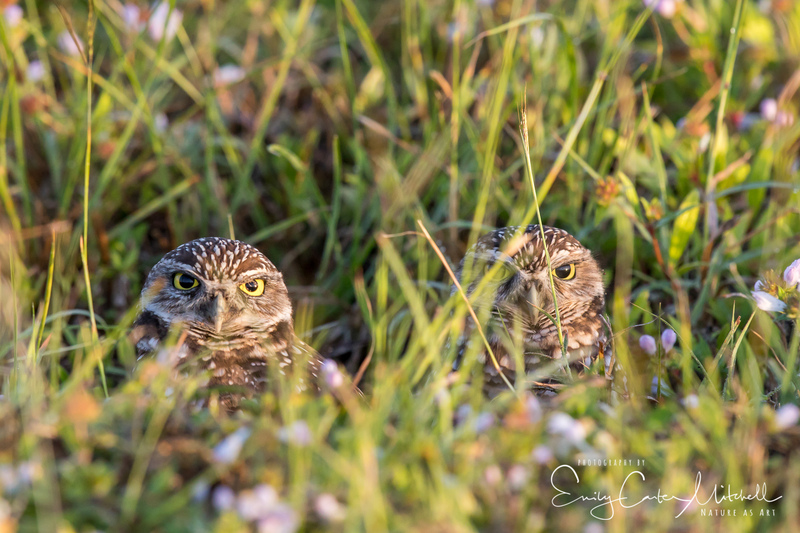 Federal mandate now protects these owls, and any burrowing owl nest holes that they may make. Regardless if the nest is active or not, one cannot destroy or develop on top of a nest. Rather the construction has to work around the nest. When one drives around Cape Coral, the careful eye begins to notice the number of empty lots with PVC pipes and cross type perches throughout. These owls tend to be out of their nest either in the morning or afternoon hours. The summertime is quiet time for them as they hunker down in their burrows to get away from their heat. As with many owls and birds of prey, early winter is mating and nesting season with their young coming out late spring to enjoy the world. 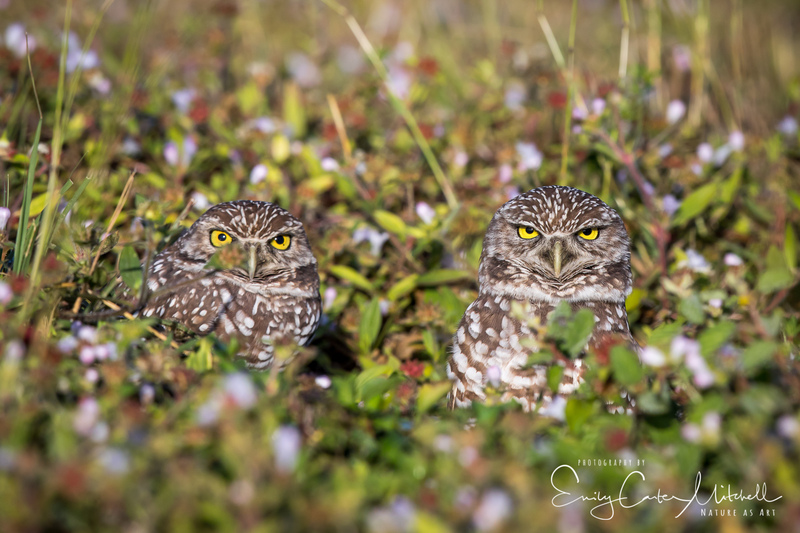 It was such a treat to visit these owls, and I was able to see at least six different nesting pairs. As with any wildlife, I kept a respectful distance and photographed them with my 500mm lens. Also, I limited the time of my visit with each pair to no more than 15 minutes. Showing respect for wildlife, no matter how accustomed they may be to mankind is the right thing to do. Now I want to back and see their babies ! If only…. “these darling little owls “: now that’s exactly what they look like! Thanks for showing them. Truly my pleasure Pit and thrilled you enjoyed them so. Lover of the baby birdies or anything baby for that matter. I think baby gators are cute – Mr. Craves just shakes his head at me – ha! Wonderful photos and what a great experience! Thanks for sharing their history. Truly my pleasure and thrilled you enjoyed these Ellen. Thank you. Hoot back at ya. Thanks! It was a wonderful year Mark and will be hard to beat. Three wonderful owls seen. Thank you so much. Those faces! I do love owls, they are so expressive. What marvelous photos, thank you so much for sharing! I hope you can get to Cape Coral too Terri. It’s wonderful. Just thing..spring and owl babies !! incredible post Emily, what great photos! and they are now a protected species.